The HY-STM32F429IG development board is a full-featured evaluation platform based on ST STM32F429IGT6 which is an ARM Cortex-M4 microcontroller for embedded applications featuring a high level of integration and low power consumption at frequencies of 180 MHz with 1 MB of flash memory, 256 KB of data memory, Ethernet, USB 2.0 Host/OTG/Device, 16-channel DMA controller, 4 UARTs, 2 CAN channels, 6 SSP/SPI, 3 I2C, I2S/SAI, 12-bit ADC, 12-bit DAC, camera, LCD controller, SD/MMC interface, motor control PWM, 17 general purpose timers, 4-output general purpose PWM, ultra-low power Real-Time Clock with separate battery supply, and up to 168 general purpose I/O pins. The HY-STM32F429IG development board takes full features of the ST STM32F429IGT6 ARM Cortex-M4 microcontroller and exposes many peripherals including UARTs, USB, Ethernet, CAN, RS485, Audio, LCD and JTAG. The board has external 32MB SDRAM, 4MB SRAM, 8MB Nor Flash, 128MB Nand flash, 256KB EEPROM and 4MB SPI Flash to enhance the memory capabilities. The HY-STM32F429IG board is provided with plenty of MDK-ARM source code and detailed document as well as some necessary cable accessories to help users evaluate, learning and make prototype based on ST STM32F429IGT6 ARM Cortex-M4 processor at a fast period. HY-STM32F429IG contains CM-STM32F4XXIG and SOM-STM32F429IG, SOM-STM32F429IG is OSHW and PCB files are available for study, learn, modification, re-production. CM-STM32F4XXIG is System on Chip module, which contains 180 MHz Cortex-M4 STM32F429IGT6 microcontroller with 32MB SDRAM, 4MB SRAM, 8MB NOR Flash and a 128MB Nand flash on a single board. The SOM interfaces to a baseboard (motherboard) using two 50-pin interface connectors. Connector: 2 connectors x 50pin 2.0mm pitch. SOM-STM32F429IG is evaluation board based on CM-STM32F4XXIG module and is routed on 2 layers only, reference design for SOM-STM32F429IG with USART, USB, LCD, Audio In/Out, 10/100M Ethernet, USB 2.0 Host/Device, it is available with PADS9.5, Protel99SE, AD, PCB files, so everyone can modify and tailor to his needs. - Hardware is not compatible capacitance, see here. - Hardware is not compatible with resistance, see here. - 5" LCD Module with resolution 800 x 480 pixels, HY050CTP-HD, recommend the whole package in here. - 7" LCD Module with resolution 800 x 480 pixels, HY070CTP, recommend the whole package in here. - 7" LCD Module with resolution 1024 x 600 pixels, HY070CTP-HD, recommend the whole package in here. 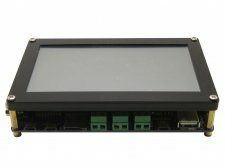 - 10.1" LCD Module with resolution 1024 x 600 pixels, HY101CTP, recommend the whole package in here. LCD connector support 16-bit true color, RGB interface. resistance and capacitance touch screen is not compatible, see here.